This comfortable 3 bedroom 1 1/2 bath home has a real "Up North" feel. The lower level has a large family room with a queen size hide-a-bed and gas stove, large entry for all your toys, 1/2 bath and a laundry room. 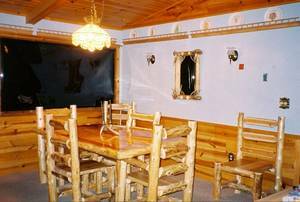 Upstairs the knotty pine great room offers a beautiful lakeview and a spacious deck. The cathedral ceilings and wood burning stove make for a romantic weekend or fun family getaway. From the two smaller bedrooms you can access a second deck that overlooks the ravine where the deer, squirrels, chipmunks, birds and yes an occasional black bear come in to feed. Bedroom #2 has a double bed and bedroom #3 has two twin beds. The full bath is beween the bedrooms and the greatroom. The split-plan master bedroom looks over the lake and has a king size bed. Bed linens are included and all beds have down comforters and pillows. 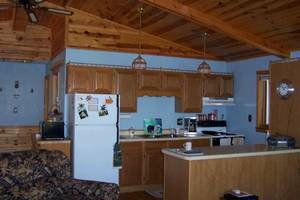 The kitchen has everything you need to make a gourmet meal, which of course means fresh fish from Deerskin lake. Catch panfish right off the dock or wear yourself out brining in that prize musky. Deerskin is 300 acres and lies in the Nicolet National Forest. Our beach is sandy and shallow, great for swimming, beach volleyball or just relaxing. A 20 foot pontoon boat with a Honda 4-stroke 50hp engine is available for rental. The heated attached 2 car garage is a real plus for the Winter renters! With ski slopes only minutes away and snowmobiling right out your front door Winter is a great time to visit Vicki's Running Doe. We highly recommend Vicki's Running Doe! We have been going to Eagle River for many many years, and this is by far one of the best! It had everything we needed for both fun and rest and relaxation. The home was beautiful, comfortable and spacious. 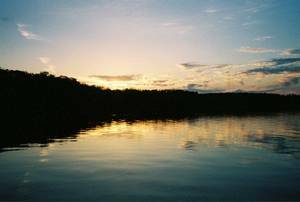 The lake is also very clean, excellent for swimming and the pontoon boat is an added bonus for cruising the lake. Hope to return next year! Vicki's Running Doe gets better and better every year. We just spent our Memorial Day weekend there and it was great !!! If you like fishing, swimming, and having fun in the water, this is the right place for you. We are coming back for sure next year. I highly recommend Vicki's Running Doe. Vicki's Running Doe is a great place. Great cabin, great lake view, everything you could need is right there. 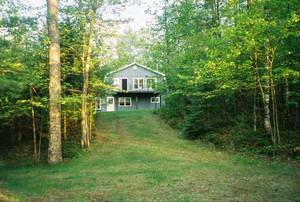 The cabin is beautiful, with a deck overlooking the lake and another one overlooking the woods. A great vacation place, with many things to do or just to take it easy and relax. I would highly recommend it to everyone. Will come back for sure !!!! Our family will highly recommend Vicki's Running Doe. We have spent a summer week there for the last three years, and have just let Vicki know that we will be returning again next year. Absolutely love it. Beautiful home.....quiet lake, extremely clean, and well stocked with all the extras (linens, towels cookware, etc)Even a closet full of games and activities for the kids on those "not so perfect" days. Wonderful shallow, sandy beach area, especially nice with little ones. We hope Vicki continues to share her home for many years to come. Another great vacation. We managed to land 6 Muskies and had several hits. No keepers. I had the most relaxing vacation at Vicki's. Everything you could need was there for you to use. 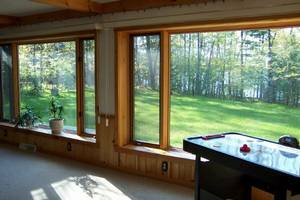 The house itself was beautiful with decks overlooking the lake and surounding woods. Vicki was always available by phone to anwser question. This is a great vacation place, with many things to do or just relax. I would highly recomend Vicki's running doe to anyone, and have already told everone at work. Thanks to Vicki for such a wonderful place for others to enjoy. this place was awesome....beautiful home and lots to do....we are definitely planning on going back in the next few years. We have stayed in many, many places in the Northwoods over the last 30+ years, and Vicki's is by far one of the nicest. Extremely private setting on a wonderfully quiet lake. Our grandchildren enjoyed safe swimming in a clear sandy beach area, and to their delight, were able to catch fish after fish right from the pier. Vicki's home was exceptionally clean, and included many wonderful amenities...a closet full of toys and games for young and old, a good selection of reading material, wonderfully comfortable beds, and much more. 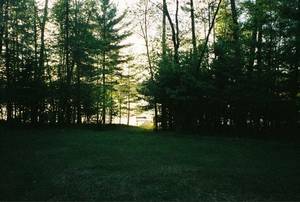 We have just put in our reservations for next year, and thank Vicki for her generousity in sharing her little piece of the northwoods with us. My family has stayed at this home several times both in the winter and summer months. The home is beautiful and the view even better. Vicki has the home nicely decorated and furnished. It is filled with everything that you need to enjoy your stay. You will definetly feel right at "home" during your vacation. The pontoon and paddle boat are a must during your summer visit. The kids love swimming and fishing in clear Deer Skin Lake. 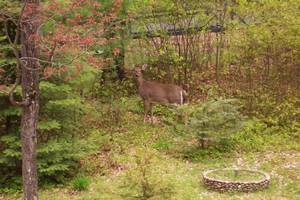 During our stay, the deer fed in the backyard and we saw a bear just a few miles away. We are going back in January for a snowmobiling trip and can't wait to get back to the Northwoods and Vicki's Running Doe! The home was very nice, the lake was quiet. We fished skied swam and just had a nice relaxing week. Our plan is to go back next year. The home was exceptionally large. Most all furniture was brand new and everything was immaculate and very clean. We felt right at home instantly. The lake and surroundings were peaceful and serene. We relaxed on the pontoon which was in excellent condition and caught fish every day. Vicki even called the second day to make sure everything was alright. We most definitely will return, perhaps even again this year! It was great! Deposit: $250-350 deposit completely refunded with 90 days cancellation notice. Deposit returned approximately 30 days after visit. Cancellations and Refunds: $250-350 deposit completely refunded with 90 days cancellation notice. Full amount due 30 days before arrival.